The General Prosecutor's Office of Ukraine has sent a motion to the court to allow ex-Prime Minister of Ukraine Mykola Azarov to be sentenced in absentia. "As for Azarov, we have completed the investigation and submitted a motion to the Pechersky court for permission to convict him in absentia," Ukrainian Prosecutor General Yuriy Lutsenko said in Kyiv on Monday morning. He said that the same situation is with the case of the former Minister of Energy and Coal Industry of Ukraine Eduard Stavytsky. As reported, Azarov served as prime minister of Ukraine from March 11, 2010 to January 28, 2014. After Euromaidan in February 2014 he left the country. Later, the ex-prime minister repeatedly spoke on Russian television, where he said that he now lives on the territory of the Russian Federation. 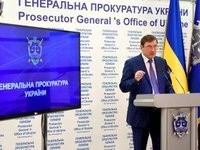 Earlier, the Prosecutor General's Office of Ukraine charged the former prime minister pursuant to Part 2 of Article 364 (abuse of official position, which entailed grave consequences) of the Criminal Code of Ukraine. According to the prosecutor's office, Azarov, while being in the office as prime minister, illegally stopped the check of violations in the activities of the state enterprise Antonov in the autumn of 2012. As a result of these actions, according to the PGO, the state suffered damage in especially large amounts of over UAH 37 million ($1.7 million). The Ukrainian court issued a warrant for the arrest of Azarov following the motion of the prosecutor's office. As reported, on March 24, 2014 the Prosecutor General of Ukraine issued a wanted notice on Stavytsky. He is suspected of large-scale embezzlement.